Large-size stone-effect slabs in porcelain stoneware. Essential graphics and vibrant colour create an extremely natural effect inspired by volcanic basalt. Essential and elegant. With their tactile force and graphics, lava stone-effect slabs are a commanding, characteristic presence in every space. 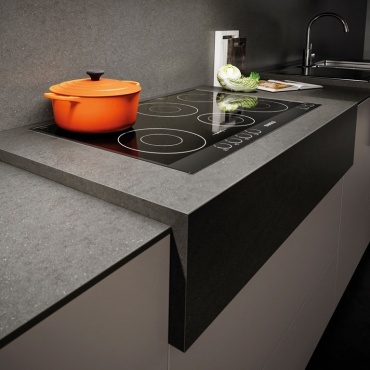 The slabs come in the size 162x324 cm and are available in a matte finish with a thickness of 6 and 12 mm. Recommended for covering tables, kitchen islands, worktops and backsplashes, ventilated façades, bathroom vanity units and bar and restaurant counters. Basaltina Volcano Habitat: Basaltina Volcano matt slabs are paired with two products by Atlas Concorde, 3D Wall Design Flash for walls and Boost Tarmac for floors. The porcelain stoneware is proposed together with other essential materials and designer objects that convey a refined mood.